Like many writers, I’ve been following the controversy surrounding the release of Harper Lee’s recently resurfaced novel manuscript, Go Set a Watchman. Lee apparently gave up on this manuscript when she wrote her classic first, and up to now only, novel To Kill a Mockingbird. In Go Set a Watchman, Scout is an adult and her father, Atticus, is an old man. The story is set in the 1950s. This pile includes three copies of my first novel manuscript, on its way to the shredder. Many successful authors begin their careers with one or more completed manuscripts that never get published. Sometimes, the author revises them later, and sometimes they go into a trunk, never to see the light of day. One of my fellow authors in an online group is in the process of doing a survey as to how many manuscripts each person completed before finding a publisher. About a third sold the first one. Another 20 percent or so found a publisher with the second. For another 30 percent, the third or fourth was the charm. (I was in this group, having sold my fourth completed manuscript as my first traditionally published novel. 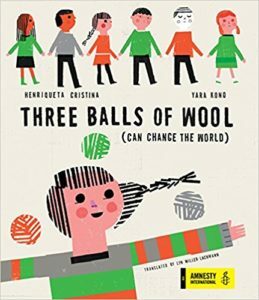 And like many others, I then rewrote and found a publisher for one of the earlier ones — the third one, which became Gringolandia.) The remaining 15-20 percent were inspiring in their persistence, writing four or more entire novels that went unpublished before the first one sold. One person wrote 13 novels before selling her first! 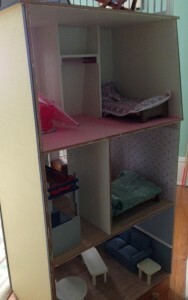 A dollhouse I built for my daughter. Maybe I should have gone for Etsy rather than a publisher. The interior of the dollhouse, with wallpaper, chair rails, and other period details. The controversy over Harper Lee’s first novel manuscript, which I suspect is far less polished than To Kill a Mockingbird, combined with the realities of moving from a 2400 square foot house in Albany to a 1000 square foot apartment in New York City, made me think about that manuscript that has been sitting in a box — actually, three boxes because I made copies — since the early 1980s. 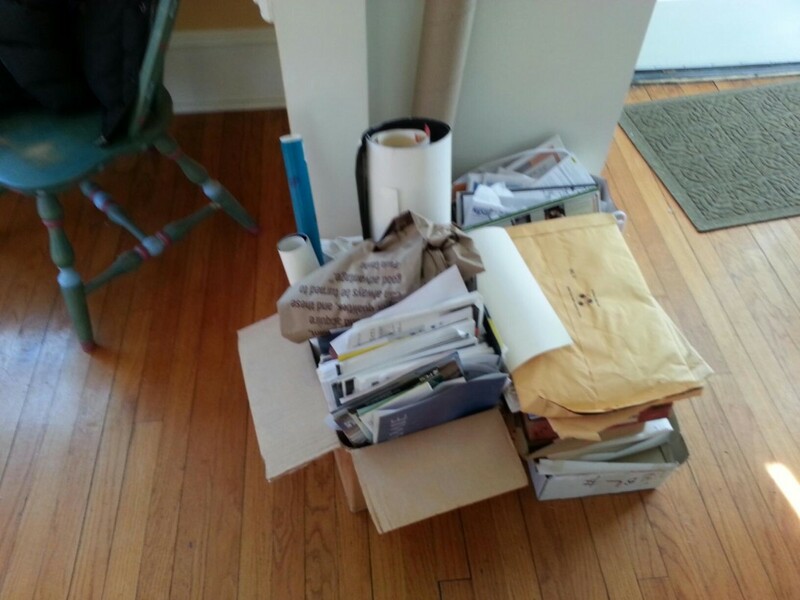 My husband was taking his mother’s old tax forms to his office to shred, so I decided to add my three boxes to the shredding pile. I mentioned that this manuscript was written and then trunked in the early 1980s — before I got my first computer. There are no electronic files in existence. My starter novel is now gone forever. If one day I become a best-selling author whose works attain the status of classics and my heirs want to monetize an embarrassingly bad unpublished work, they are out of luck. 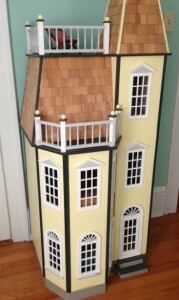 I wasn’t heartbroken to get rid of my first completed manuscript, but having to sell a dollhouse that I made for my daughter 17 years ago and that she didn’t want to keep (because her New York City apartment, which she shares with a roommate and a dog, is less than half the size of mine) did break my heart. This was a Barbie-size house, three stories tall, and I installed a wood-plank floor, wallpaper, a chair rail in the first-floor living/dining room, and handmade furniture that I either found at craft fairs or made myself. 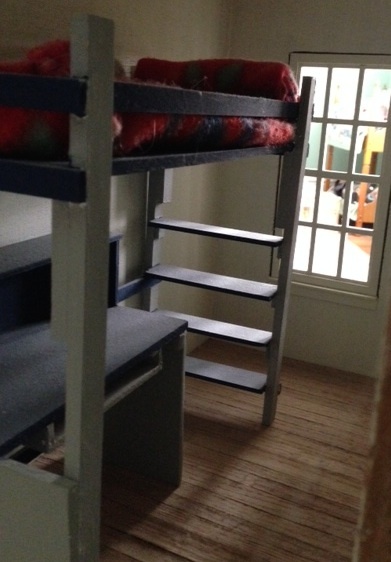 My favorite piece of furniture was a sleep/study loft I built, modeled on real lofts that I constructed for my fellow undergraduates at Princeton. My favorite piece of furniture was the loft bed I made. 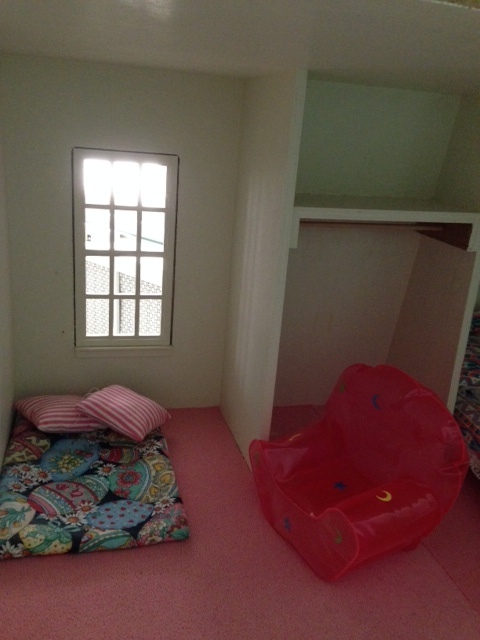 I also sewed curtains and blankets for the doll residents of the house. 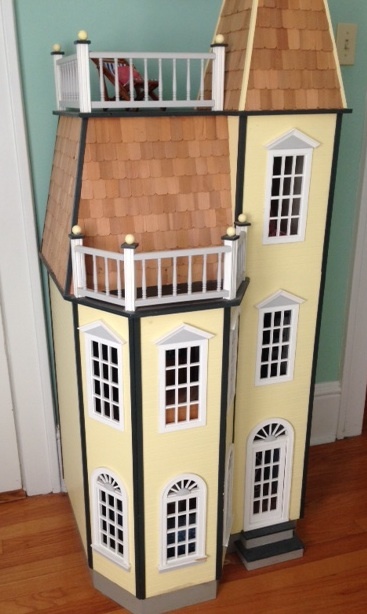 I console myself with the fact that the dollhouse is going to a nice home — twin girls in my seventh grade class and their three younger sisters — and with a new generation playing there, the house won’t collect the dust that appears in the photos I took when I listed it for sale. 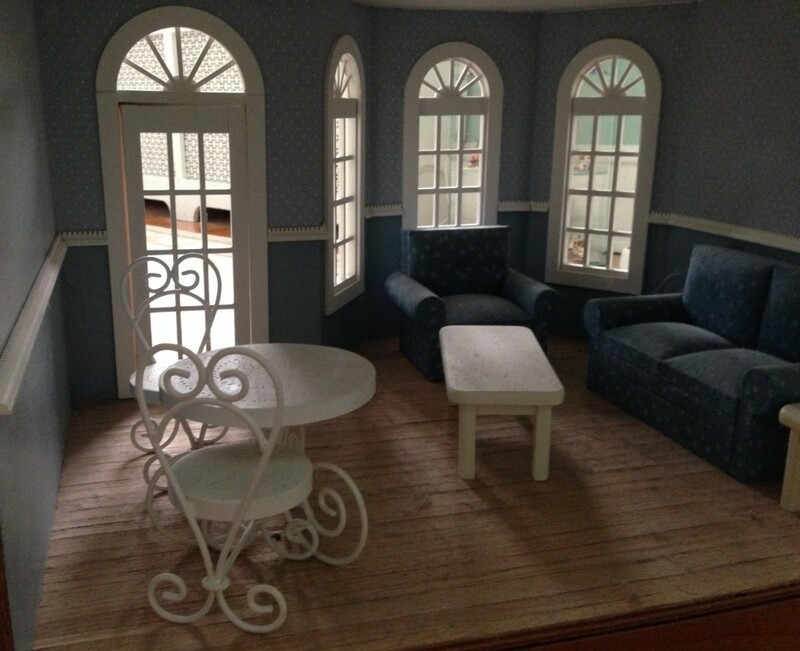 I’ve included these photos of my dollhouse for your enjoyment — hoping, though, that you don’t think Etsy would be a better place for my talents than a publisher. 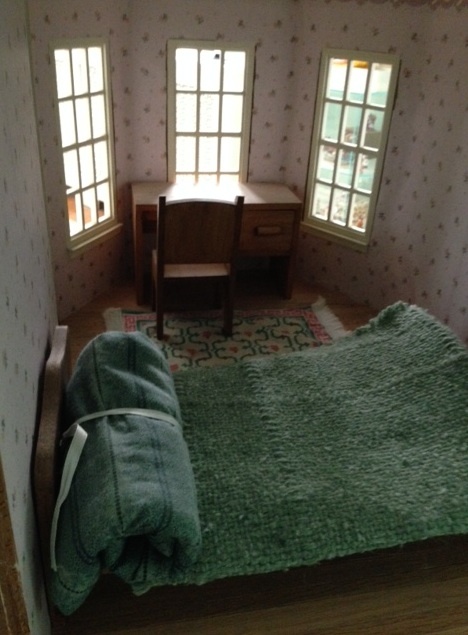 The attic, with carpeting and furniture. The first floor with old-fashioned details and a lot of dust. What a beautiful dollhouse, Lyn. It’s hard to let go, isn’t it? I have so many manuscripts in a drawer and on my computer. I’ve had to let go so many times. I don’t know how many tries I have left in me. I was able to cannibalize or revise a couple of mine, so I didn’t have to let go of them altogether. And I’ve discovered that my historical novel work-in-progress addresses the same theme as my contemporary novel/VCFA creative thesis, that never found a home and that I may end up self-publishing. The story about shredding your first novel sent a shiver through me. 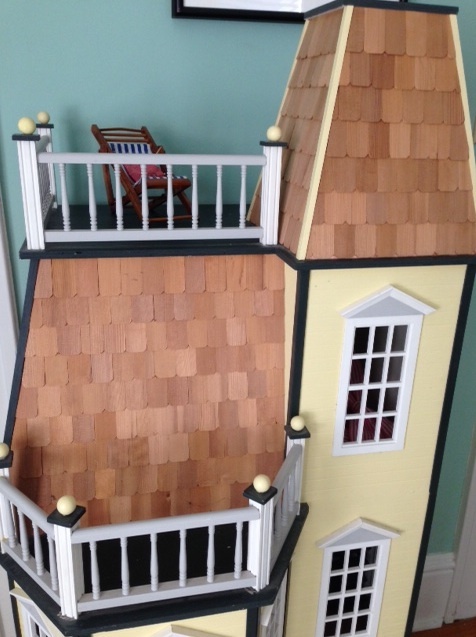 The doll house is beautiful, with such amazing details. I’m glad it found a new home.